The launch of the ‘Your Truck Your Gym’ campaign was a vibrant function attended by some 125 people from a broad spectrum of the industry comprising partners, suppliers, truck operators and truck drivers. Here energetic drummers get the gym rolling. A healthy truck driver is a safer truck driver and it is with this in mind that FleetWatch truck magazine – in collaboration with a number of industry partners – last Friday launched a ‘World First’ exercise programme for truck drivers which will enable drivers to get fit by using their trucks as their gyms. Called Your Truck Your Gym, it has been endorsed by The Road Safety Foundation South Africa. “Truck drivers in the main are not the fittest guys around and yet they should be given that they need a high level of alertness on the roads. But where are they supposed to exercise? 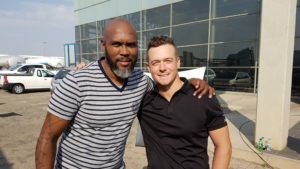 They cannot begin or end their day by popping into their local Virgin Active as many of them are stuck at border posts, parked off at truck stops or at loading or off-load points where there is no gym in sight. “Through the Your Truck Your Gym programme, we intend changing that by enabling drivers to use their trucks as their gyms. It’s all about road safety and the health of the truck driver,” says Patrick O’Leary, editor of FleetWatch magazine. To realise the dream, FleetWatch sought industry partners who would share the vision and is proud to have on board GRW, MAN Automotive South Africa, Shell Lubricants, Cartrack, Hollard, Trucking Wellness – which falls under the National Bargaining Council for the Road Freight and Logistics Industry – and NOSA Logistics. “Without these companies, this project would never have come to fruition. Their commitment to the health and well-being of the truck drivers of South Africa is total and will go a long way towards ensuring safer roads through healthier drivers,” says O’Leary. To ensure professional input into the exercises, FleetWatch approached the Biokinetics Department of Stellenbosch University which falls under the University’s Department of Sports Science, to devise a series of exercises using the equipment on the combination truck tractor and trailer as the drivers’ personal gym. A team of students was allocated to the task and under the guidance of Dr Elbé de Villiers (PhD Sport Science), and project leader Kimberly Smith, the team was provided with two rigs by MAN and GRW which they had use of over three days to work out the exercises. 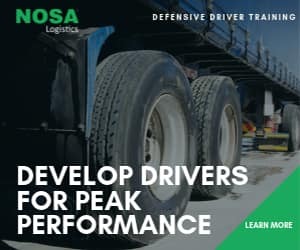 What they came up with was, in O’Leary’s words, “mind-boggling” with over 60 different exercises structured specifically to cater to the needs of the driver. 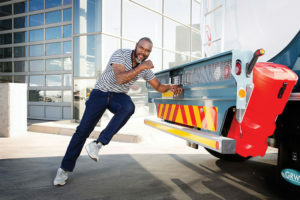 Brian Baloyi, former Bafana Bafana goal-keeper and Kaizer Chiefs goal-keeper coach, has a passion for saving lives on our roads and is the face and Ambassador of the ‘Your Truck Your Gym’ campaign. Here he demonstrates just one of the over 60 exercises contained in the programme. The programme then needed an ‘Ambassador’ – but it had to be someone who had a genuine desire towards making a positive impact on improving South Africa’s dismal road safety record. Enter Brian Baloyi, former Bafana Bafana goal-keeper and Kaizer Chiefs goal-keeper coach, who has a passion for saving lives on our roads. Baloyi, along with Dylan O’Leary, a fitness fanatic and a man who has grown up with a passion for the trucking industry via his dad’s involvement, are the guys featured in all the exercises demonstrated via photographs and videos in both a booklet and an App specially developed for the programme. The App is a crucial part of the programme for it allows drivers – both locally and internationally – to download the Your Truck Your Gym App from either the Android store or Apple store – depending on which phone they have. 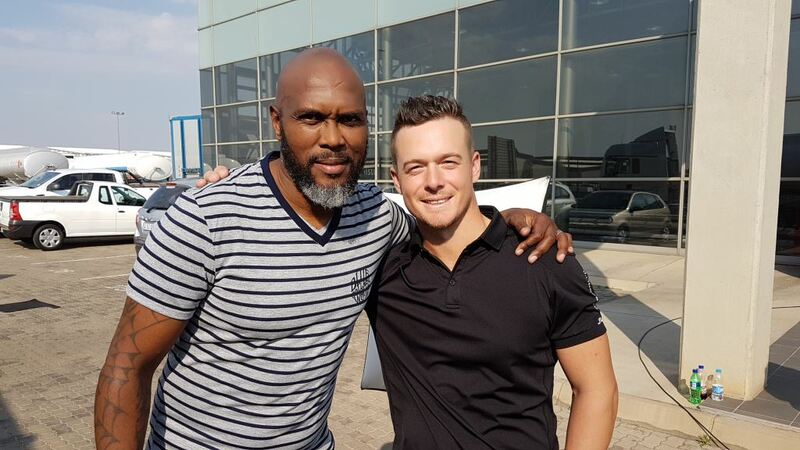 Our two fitness gurus, Brian Baloyi (left) and Dylan O’Leary who demonstrate all the exercises contained in the ‘Your Truck Your Gym’ App and 100-page booklet. The App – which can be downloaded for free – guides the user through all the different exercises via graphics and videos using countdowns for each exercise and then stores the performance of each individual driver for reference as well as progress reports. Monthly prizes will be allocated to the top five drivers who show the best progress. 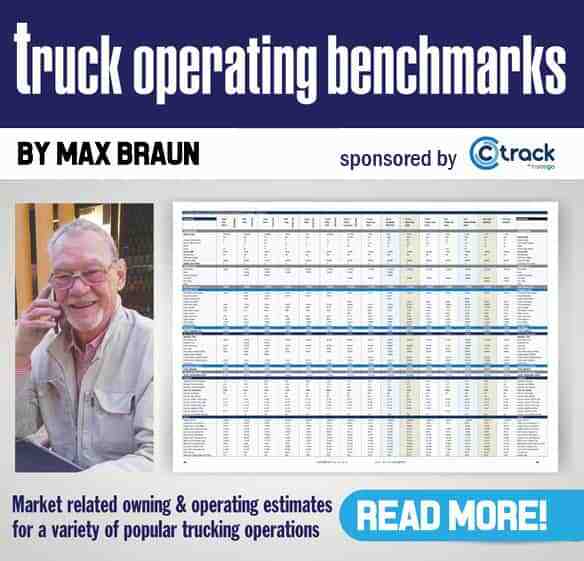 A number of other built-in features have been enabled, one being where a trucking company can hold its own internal competition between drivers by tracking their progress. Features to ensure confidentiality have been built into the App. Although most trucking companies now have their drivers operating on Smart phones, for drivers without a Smart phone, a 100-page book has been produced which shows in detail the various exercises via photographs as well as videos accessed by QR scans. “The development of the Your Truck Your Gym programme has been a fascinating journey and we feel that, with the committed support of our partners, we’ve come up with a Proudly South African campaign that can be used by truck drivers not only locally but throughout the world. “Most importantly though, is that it is a programme that will enhance the lives of truck drivers while at the same time contribute to greater safety on our roads,” says O’Leary, adding that if only one live is saved through this programme, all the effort put in by everyone will have been worthwhile. “That life could be yours and I guess saving your life is pretty worthwhile to your family,” he concludes. For further information on how your company or drivers can participate in the Your Truck Your Gym programme, please email Kylie Saunders at kylie@fleetwatch.co.za.